Xinjiang, the north western Autonomous Region of China, covers the old land routes into China. Much of Xinjiang, the largest province, is desert with patchy vegetation only suitable for light grazing. It was settled by central Asian tribes over the centuries who look more to the countries to the north and west than to Beijing. Most of its people are Turkish speaking Muslims; there are Uyghurs but also Mongolian; Kyrgyz; Tajik; Hui and Kazakh people. [Note: Uigur is variously spelled Uyghur or Uighur or Uygur] As a border zone it has only periodically been under Chinese control. It was considered part of China whenever China was a powerful nation : the Han; Tang; Mongol and Qing dynasties. With such an arid climate the towns are located close to water sources on the strategic Silk Road into China. The threat of terrorist attacks by Uigur separatists has led to travel restrictions in the province. It is important to check the current regulations before traveling. Turpan ➚ (Turfan) is the lowest at 505 feet [154 meters] below sea level and hottest place in China (121 ° F [49 ° C]) with ancient aquifers providing the water supply via long, subterranean channels to keep the oasis green. Only the Dead Sea ➚ is in a deeper depression. It is famous for its grapes, there is even a Grape Valley ➚ resort. Moonlight Lake (Aydingkol ➚) is a salt lake at the center of the depression. West of Turpan are the famous Flaming Mountains ➚which can reach an unbearable 176 ° F [80 ° C] in summer. These mountains feature in the Journey to the West which is the story of Buddhism's arrival into China. Nearby are the ancient ruins of the abandoned town of Jiaohe. Urumqi ➚, the capital of Xinjiang is an important transport hub inhabited mainly by Han Chinese. It has a large museum covering finds from the whole province. It claims to be the city furthest from the ocean anywhere in the world. The Southern Pastures ➚ scenic spot is located nearby. Heavenly Lake ➚ (Tianchi) east of Urumqi is a beautiful lake hidden in the Tianshan mountains which manages to trap a little elusive moisture. The ‘Iron Tile’ Temple or ‘Temple of Happiness and Longevity’ was built by Qing Emperor Qianlong on the nearby mountain. The Taklamakan desert is free of vegetation and a real desert; it remains a perilous region to cross. Ancient cities have been engulfed by the sands over the centuries, as at Niya ➚. The Silk road had two main routes to avoid the desert: to its north along the edge of the Tianshan mountains through Kuqa and Korla and to on its south through Hotan (Khotan) and Qiemo. 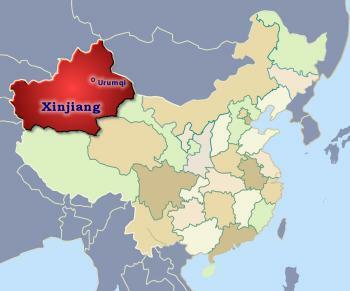 The southern region of Xinjiang is part of the Tibetan plateau and borders Tibet and is the bleakest region. In 1964 China carried out its nuclear tests at Lop Nor ➚ a desert area to the east of the Taklamakan. The Kunlun mountains ➚ that form the southern border of Xinjiang are famous as the source of jade which has been mined there for thousands of years. Kunlun is also the reputed home to the legendary Queen Mother of the West. Boulders of jade can still be found on the banks of the Karakax (Karakash) ‘Black jade river’ and the Yurungkash ‘White jade river’ 白玉河. In the far west at Kashgar there is a stronger Uigur influence evidenced by the Arabic style grand Id Kah Mosque ➚. The Aba Khoja mausoleum ➚ is one of the best examples of Islamic architecture; while the Kizil Caves ➚ house many fine Buddhist sculptures. The main land route to Pakistan, the Karakoram Highway ➚, passes through Kashgar. The ancient city at Taxkorgan (Tashkurgan) is the home of many Tajik (Tadzhik) people. After the high pass at 15,750 feet [4,801 meters] the road slopes down into the Hunza valley ➚ into Pakistan. 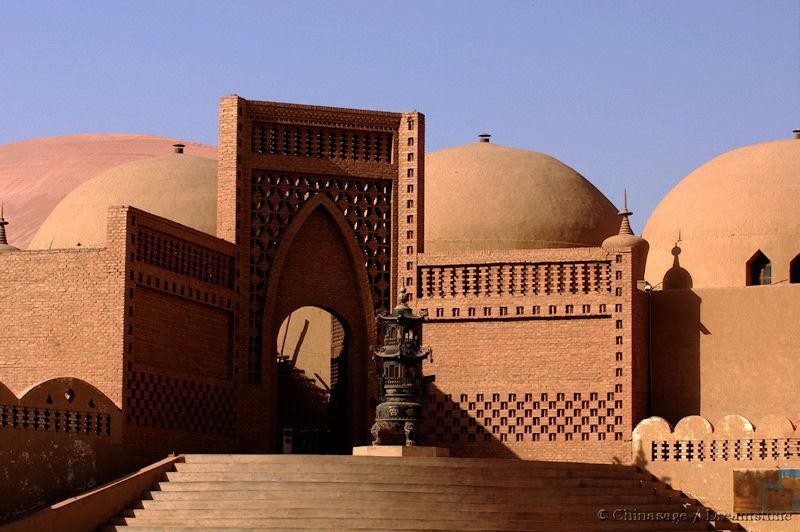 The town of Kuqa south-west of Urumqi has a strong Islamic influence with a Grand Mosque. Nearby though at Kizil are the Bezeklik Thousand Buddha Caves ➚ which unfortunately were plundered by Western explorers. Hotan on the less used southern strand of the Silk Route is like a small and quieter version of Kashgar. Jade , carpets and silk are the main items of interest and there is the Hetian Silk Factory that can be visited. The second highest mountain after Everest is K2 or Chogori ➚ (28,251 feet [8,611 meters] high) that stands on the Pakistan border with Xinjiang. South-east of Turfan is Gaochang ➚ where there is an ancient, abandoned Silk Road trading post with impressive gate-towers and many archaeological remains. In the far north west of Xinjiang there is the scenic tranquility of Sailimu (Sayram) Lake ➚ near Altai. Yining (or Gulja) was once the capital of the Khanate of Chaghatati ➚ who was one of Genghis Khan's four sons (another grandson Kublai Khan ruled China). It is located on the Ili river and geographically belongs to Kazakhstan. Shanghai City was known as the 'Paris of the East' in the 1920s. By Chinese standards Shanghai is a very modern city. It was just a small fishing port in the 1840s with population of only 50,000; by 2007 this had risen to an incredible 24 million (2016) making it the largest city in China. It is considered China's second city. Xinjiang was precious to China when the Silk Road was the major trade route into China but proved hard to control. It marked a buffer zone outside the official gateway into China which was at Jiayugyuan in neighboring Gansu. Rebellions in 1855-71 led to the massacre of many Muslims. On the fall of the Qing the area once again fell to local rebellions and war lords. Frictions with Russia in the 1870s led to some erosion of the vague northern frontier. In 1955 it was designated as the ‘Uygur Autonomous Region’ to confer on the province a sense of local control, however it has little actual autonomy. Terrorist attacks by Uighur separatists still occur from time to time, it remains a politically sensitive region. 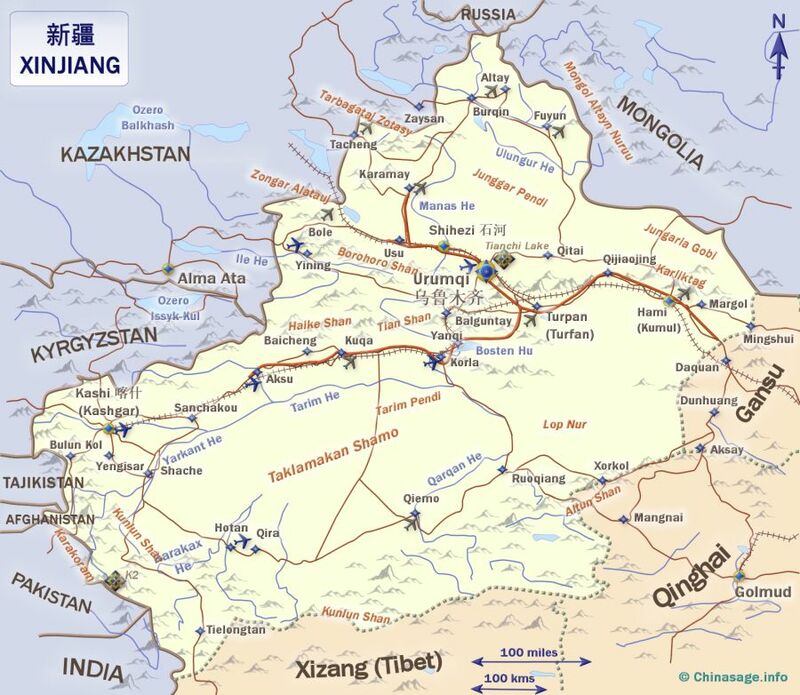 Xinjiang is rich in oil and gas reserves, which is another reason why the province is important to China. Historically it has been named in the West as ‘East Turkestan’, indicating its real geographical location. Both Chinese and Arabic are taught in schools although proficiency in Chinese is the passport to employment. Many families have links with neighboring countries and Russian influence is considerable. Border clashes with Russia ➚ took place in 1969 and 1974. Despite being 1,500 miles [2,414 kms] west of Beijing the province officially uses Beijing time (as over all China) but local Xinjiang time is sometimes unofficially used which is 2 hours behind Beijing time. 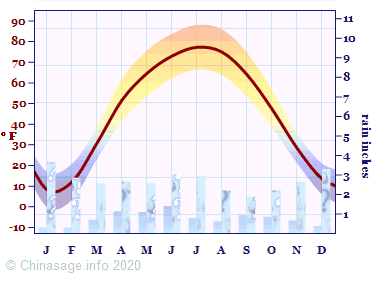 Mountains to the far north-west receive a little more rain and support more agriculture. Watermelons; cotton; pomegranates; walnuts and grapes (especially at Turpan) are grown. Sheep grazing is widespread in Xinjiang and so lamb is the most widely available meat and features heavily in the cuisine. Areas around Urumqi are heavily industrialized while much of the remainder of Xinjiang remains desolate. Citation information for this page : Chinasage, 'Xinjiang Autonomous Region, China', last updated 30 Nov 2018, Web, http://www.chinasage.info/maps/xinjiang.htm.